I can remember as a kid, Thanksgiving dinner and gagging over a plate of ‘candied’ yams, you know, sweet potatoes fried (in probably Crisco) then topped with brown sugar and marshmallows. Whoever came up with that recipe?! Like hey, let’s throw some marshmallows onto these sweet potatoes. So weird. I mean, if you like it, more power to you. But I LOATHED these as a kid. I mean instant gag reflect. Fast forward thirty years (did I just give away my age) and I’ve learned to actually LIKE sweet potatoes. Not the covered in sugar and marshmallow kind, but the root vegetable itself. This is my go-to when I’m wanting to chow down on some good, slow-burning carbs. Nom, Nom, Nom. What’s even better is when I can add some heat to these bad boys and savor that nice sweet flavor with a spicy kick. 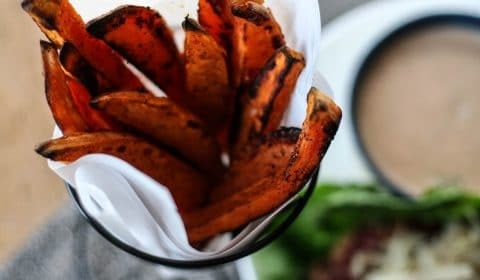 Behold, spicy sweet potato fries. Fries are my kryptonite. You can put chocolate in front of my face and I’ll pass. (So weird, I know) I mean, I’ll take a bite or two but then I’m good. Fries on the other hand, I could Scooby-Doo those suckers down in a millisecond. That’s what brought me to my new found love affair with sweet potato fries. A much healthier alternative in the Paleo world (in moderation, of course). But when the fam is chowing down on hot wings and fries, I’ve got my trusty homemade sweet potato fries to turn to. Winning! 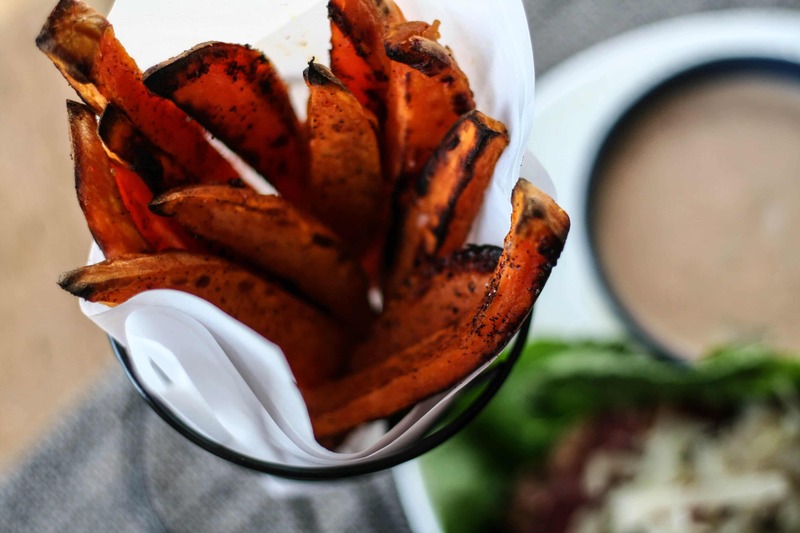 For this recipe I would recommend slicing up your own sweet potato fries, forego the store-bought versions. You can make them as thin or thick as you like. Leave the skin on or peel them, your call. Either way, they are DIVINE.